What time is Thanksgiving dinner? How about 8? So why do we eat it in the middle of the afternoon? Thanksgiving dinner by candlelight. Doesn’t that look and taste better? Picture with me, if you will, the perfect holiday feast. The table is set with glittering china and festooned with seasonal symbols—festive boughs of holly, perhaps, or a cornucopia of autumnal flora. Inviting candlelight fills the room, casting a pleasing glow on the faces of the assembled. The buffet overflows with scrumptious dishes—which have been simmering happily in the kitchen all day—glistening in the soft light, their tantalizing smells wafting into the cheery air to mix with strains of dulcet music from some unseen source. All is well. Now endure with me, because you probably will, the holiday meal that most Americans inexplicably choose for themselves. The table is set with the same materials, but, because it is 3 p.m., the harsh winter light streaming violently through the windows casts an unappealing pall across all of them. Candles cannot hope to compete with the sun, so everyone looks and feels washed out and, as a result, prone to petty palpitations and the flaring up of old resentments. (No wonder holiday is synonymous with rancor for so many!) Over on the buffet, some foodstuffs—many of which were prepared yesterday or earlier due to time constraints and so are soggy or dry—turn gray in the glare, their muted odors seeping into the wan atmosphere to mix with grunts from the broadcast of a football game in the other room. All is … whatever. What’s my main beef in this season of poultry and pork? The perplexing American custom of the midafternoon holiday meal. Across our great nation this Thanksgiving, loving families with gather ‘round their tables at 2 or 3 or 4 p.m., times at which on no other day of the year they would eat. Christmas and New Year’s will be similarly poorly scheduled. Dietary patterns will be dangerously disrupted, the lighting will be all wrong, and days of preparation will culminate not with a cheerful midnight farewell filled with yawns and kisses of love and gratitude, but with everyone snoring loudly over the sunset. Why do we do this to ourselves? Why, when everyone knows that dinner—especially a dinner party—is served at the hallowed hour of 8 p.m., do we shift the most wonderful dinner party of the year to a chrono-culinary no-man’s land? Some will cry tradition—and they will be invoking a vile and insidious concept that has been used to excuse everything from child brides to segregation. But let’s allow that traditions are at least worth considering before we toss them out: Why do Americans insist on the midafternoon holiday meal? Though food history is a somewhat murky subject, it does provide a plausible base explanation. Before the advent of artificial lighting and the 9-to-5, post-agrarian workday, meal schedules were understandably different. Roughly speaking, people rose with the sun, had a little something to break the fast, and worked until the main meal, “dinner,” usually sometime around 1 or 2. (Lunch was not really a thing until the early 20th century.) From at least the Middle Ages, dinner was the meal for celebrations and showing off the silverware—the richer you were, the most elaborate your dinner would be, often lasting a number of hours. Supper, meanwhile, was something of an afterthought, a little snack of leftovers before bed just as the sun faded away. Over time, however, the dinner hour crept later and later, especially among the middle and upper classes, settling somewhere in the 6 p.m.-to-8 p.m. range that we generally observe today, and the three-meal pattern became the norm. Much more could be said on the evolution of mealtimes (the BBC and History Magazine both have longer treatments), but the lesson is clear: We are being positively medieval in celebrating the year’s fanciest dinner in the midafternoon. It’s like rolling out the rack or popping open a vial of the plague once a year for old time’s sake. Huzzah! But seriously, we don’t need to structure our meal that way anymore. Edison conquered the darkness, and the miracle of industrialization means that candles (or even torches, if you are so inclined) come cheap. Most people do not go to bed at 6, so it’s possible to eat at 7 or 8 and still have a few hours to digest before retiring at, say, the perfectly reasonable hour of 11. Plus, modern medicine tells us that such a random departure from our regular eating schedule confuses our bodies, making the inherent overindulgence of Thanksgiving that much worse. Oh, and a final bit of history: The cooks and scullery maids of yesteryear had to rise at ungodly hours to make that midday meal possible—sound familiar? 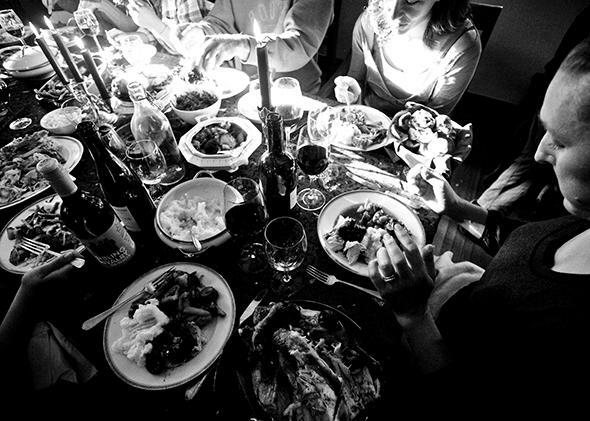 If we quit it with this early holiday dinner business, much of the elaborate make-ahead planning and day-of cooking freakout could be avoided because you’d actually have a normal amount of time to prepare a big dinner party—which, again, is exactly how Thanksgiving should be regarded. If you feel that Thanksgiving is a time to watch other people be active on TV while you nosh and molder on the couch, let’s just say it’s probably best that we will be attending different gatherings this year. Indeed, the only quibble I’ll allow is that some guests require travel time after the meal. In that case, make it 6, finish by 9, and they’ll be home by 11—if someone lives more than two hours away, they should probably be staying the night anyway. As you might have guessed, I will serve my Thanksgiving meal this year at 8. However, I should note that, back home, my grandmother will serve it around 2. Because I value her judgment above most others’ (and because she reads me and I do not want one of my childhood “attitude adjustments” at Christmastime), I thought it wise to present my argument to her for comment. Her reply: “I just try to work out a time that fits everyone’s schedule as best I can. [I try to] have that turkey or ham on the table when everyone gets here so we can all enjoy not only the food, but the fellowship, too.” Gramma is right about one thing—it’s the fellowship that matters most during the holidays, regardless of the start time. But in the same way that sweet potatoes are best draped in toasted marshmallows, can’t we agree that fellowship is most satisfying with just a dollop of starlight?